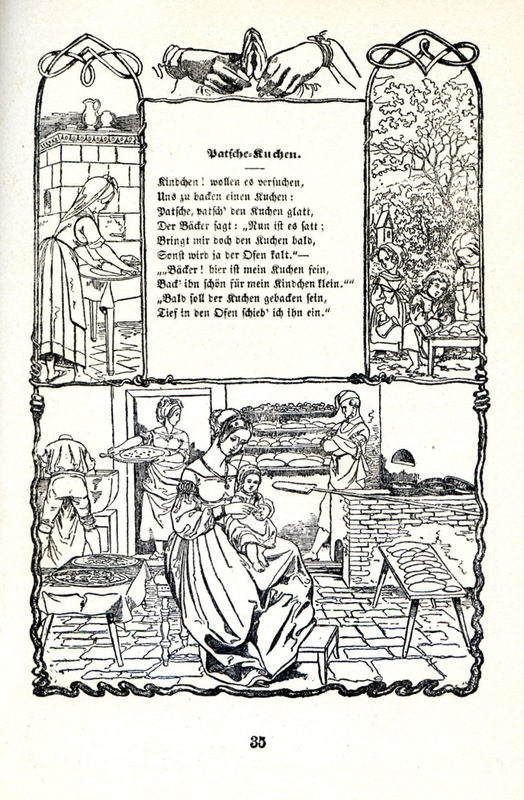 Early Childhood Education, now referred to by the acronym ECE was first invented by Friedrich Froebel who having lost his own mother at an early age observed the relationship between mothers and their children, noting in fact that the games that German mothers played with their children were educational. From that particular insight, Froebel invented Kindergarten. He was among the first to recognize the role of mothers in education, but also that it would best begin while the child was still in the mother's arms. Here are three books that might be of interest to those who are beginning to understand that schooling, and particularly early schooling, should be more than reading and standardized tests. In the wood shop, I've been working to finish chapter 4 of the book on tiny boxes and playing with a bit of inlay for chapter 5, as shown above. 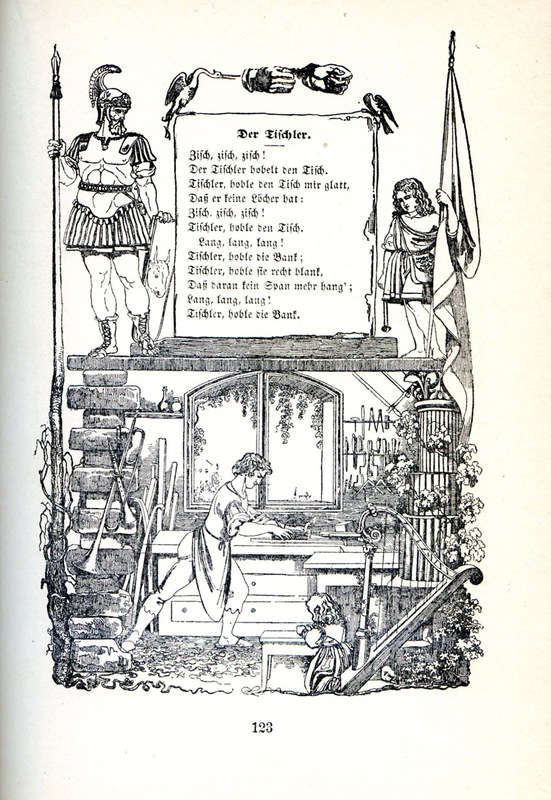 Through songs and Mother Play, Froebel's Kindergarten conveyed the importance of each individual within the culture. The joiner, was one of the craftsmen that he chose to illustrate. Note the hands at the top, and all the various things he has made. Originally, Kindergarten was about more than getting ready to read and take standardized tests. 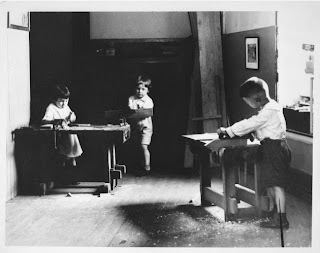 Froebel's Kindergarten was a time and place in which children were introduced to the various occupations that formed the basis of culture and community. By using hands, held in the manner shown at the top of the illustration, the child might grasp a sense of his or her own creative capacity. 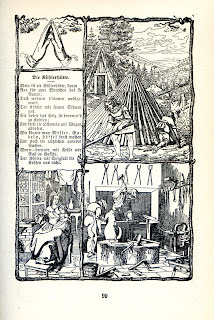 One of my favorite illustrations from Mother Play is that of the Charcoal burner. The hands form the image of the woods stacked for the fire, and the shape of the charcoal burner's crude hut. 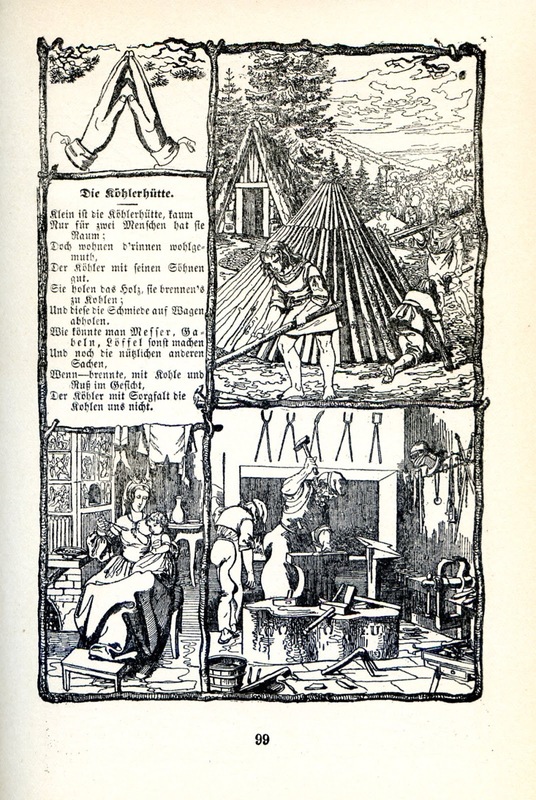 Shown also, are scenes that illustrate the importance of the charcoal burner's work... in the warmth of the home and of the blacksmith forging iron. One of the elements of Kindergarten that was picked up by advocates of educational sloyd... creating a sense of the dignity of all labor. We seem to have ceased to adequately celebrate craftsmanship and community in American culture. The solution lies in the exercise of our hands in the creation of useful beauty. 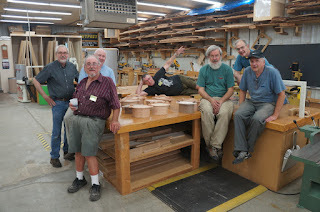 It is lovely to be home in Arkansas after a full seven days of box making at Marc Adams School of Woodworking. I started with a weekend class on making Scandinavian bent wood boxes, and then made boxes for five days with 16 students. Each student went home with several boxes using various joinery techniques. Students in both classes learned new skills, renewed creativity and gained greater confidence. I 'm grateful for my assistants, Jerry Forshee and Doug Dale who kept my students safe during all their labors. This last week was amazing. I will return to Marc Adams School on July 24 more days of box making. Students need not be experienced box makers to participate and learn from either the weekend or week long class. As I turn my attention back toward my current book projects, I wish to share an understanding of the relationship between Kindergarten and the hands. 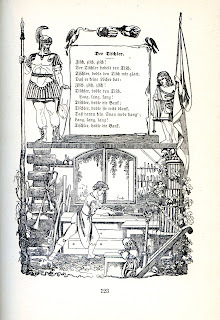 Each illustration from Mother Play, Froebel's book about games and songs that mothers could play with their children, has the image of a hand or hands at the top, and each song used the engagement of the the fingers, the hands and body benefit the child's understanding of community and the surrounding life to be found in nature. And so Kindergarten was not intended as a time to prepare children to read. It was to prepare all children to live as human beings. At one time the central role of the hands in learning was unspoken, as it was abundantly clear to all that the hands were central to every facet of human life. Then mechanization and dehumanization began to take place, separating the hands from learning and from life to the point that the centrality of their engagement has become less clear. If you played pat-a-cake as a child or with your children, you have Friedrich Froebel to thank for it. Click on the images to see them in a larger size. 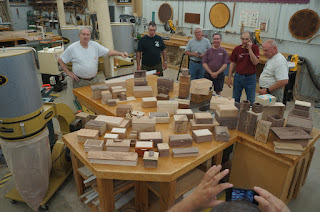 My students at Marc Adams School of Woodworking had a show of boxes as we wrapped up our week. 16 students made over 60 boxes. I am packed and ready to fly home, having made a number of new friends. 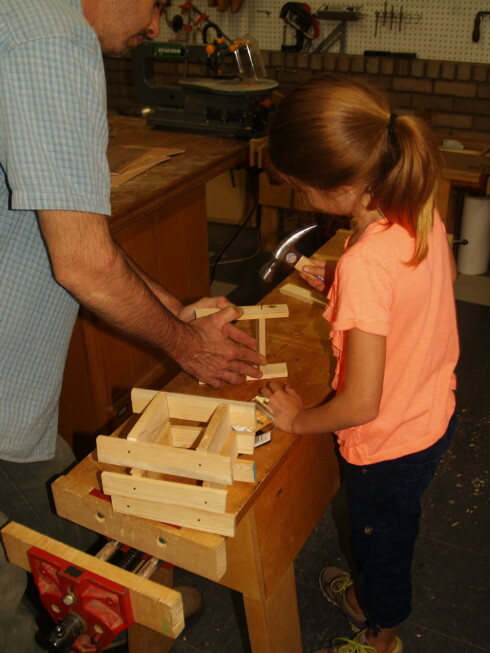 Today at Marc Adams School of Woodworking we will show project slides in the morning, then more demonstrations, and students will explore making their own boxes in various designs. In the meantime, in Australia, students are busy in their normal school year. Richard Bazeley sent this photo of a dog made by his students with shop made tinker toys. 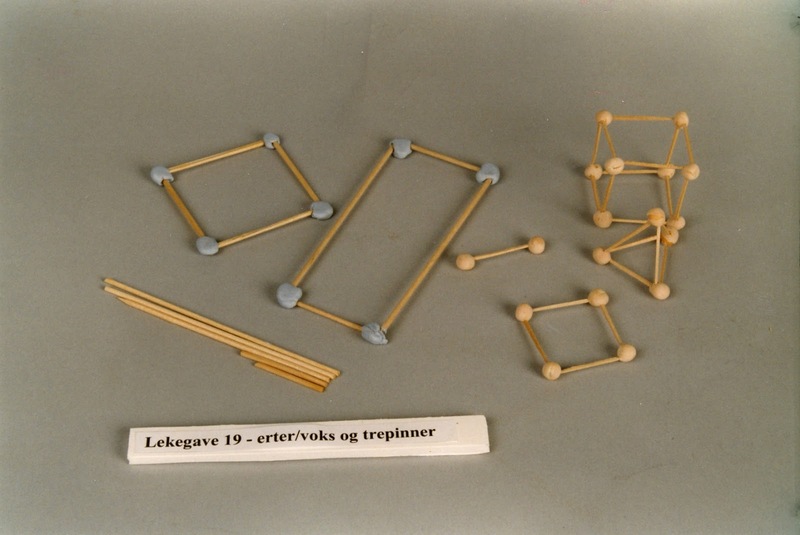 A similar photo came from the Folk Museum in Trondheim, showing Froebel's sticks and peas. risk, error, and discovery, and that an attitude of self-forgiveness is essential to steady progress. Yesterday, I demonstrated installing miter keys in miter joints, how to make a router jig for oversized finger joints, how to cut the lid from the base of a box, and a variety of smaller tasks. Today I will demonstrate some additional joints and how to make wooden hinges. We will also begin the process of making inlay. My students are all exercising their own creativity. In some classes, students make things according to their teacher's design. In this class students simply work to meet their own aspirations. In my box making class at Marc Adams School of Woodworking, I have 16 students, now with some initial instruction, and all busy making boxes. This class is rather unique in that students will be making boxes of their own design, using the school's tools, jigs and fixtures I've made, and techniques that they have been taught in the class. The photo shows my students during "safety talk" in which students are given the rules for safe use of tools. They're not actually "set loose," however, in that constant attention is given to oversight on their safe use of tools. Make, fix, create, and enable others to do the same. did very nice work as you can see in the photo above and below. 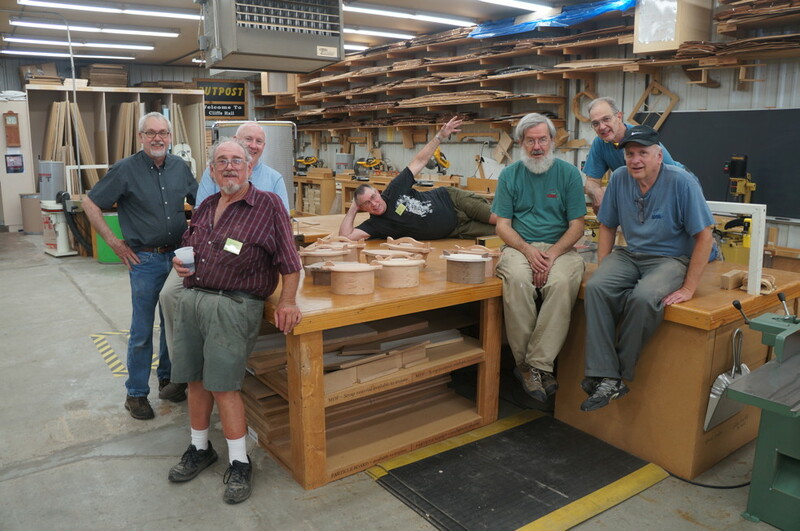 Most of my students are of a certain age, which leads to the question of how we will encourage new generations of woodworkers to take a hand in the art. If you were one of the Koch brothers you might throw a billion dollars into an election to make dead certain everything goes your way. If you are a craftsman, you might work within a smaller sphere. For instance, one of my students from my weekend class plans to take what he has learned of making Scandinavian bent wood boxes, and use it in the big brother/big sister program. He'll take what he's learned and offer a leg up to others, that they might also learn. The Koch brothers would get much more bang for their buck if they were to mobilize creativity in America, rather than using their vast resources to induce Americans to vote against their own best interests. Needless to say, craftsmanship is transforming. By taking basic raw materials and to use skill to make something lovely and useful is to transform self. The consequences of failing to engage children's hands creatively are clear. But the consequences of this failure are not only to the intellect . The hands are also the instrument of moral development through the exercise of craftsmanship. And so the failure to connect the dots between the use of the hands and the development of the whole self places a heavy burden on American culture. Today I begin a class in making Scandinavian bentwood boxes at the Marc Adams School of Woodworking. In the meantime, we need to begin a national discussion about the use of tools to engage the minds and hearts of our nation's youth. Removing wood shops from our nation's schools was dumb and destructive, particularly in light of what the original objective of those wood shops was: to develop the character and intelligence of our nation's youth. The night before last a young man walked into a church, sat through an hour of Bible lessons and then pulled a gun. Exercising his pretense of racial superiority, he stopped firing only to reload 5 times as he ended the lives of those who welcomed him to their discussion of Christ's love. Nine dead. So what's up with American culture? The boy's father gave him a gun on his 21st birthday, even though he appeared to be a troubled youth. It would have been far better for his father to have given him lessons in the wood shop so that he might have learned some valuable skill and been transformed by craftsmanship. The kid was a high school dropout who might have found some value in himself, had education been required to engage his creative potential. Craftsmanship is a powerful tool in the development of character and intelligence. In addition, tools of all kinds have powerful effect on the psyche. Holding a beautifully crafted plane in one's hands can convey a sense of creative power, leading to the inclination to make, rather than awakening and feeding a murderous intent. I'm generally disgusted with our media, our culture, and the irrationality of our American fascination with guns. Do folks not understand the relationship between mental disturbance and the failure of American society to engage children in the process of making useful beauty? I am in a motel room, over half-way in my trip to Marc Adams School of Woodworking. So, on TV, the talking heads go on and on. Even they do not understand the way that working with wood centers and empowers the psyche and soul. They do not understand the hand's natural impulse to assert power and control over the materiality of life. For some reason they do not see the connection between the saw, chisel, knife and gun. Those who are not empowered in the creative use of tools, are pushed toward and inclination to engage in destructive acts. Is that so very hard for folks to understand? Perhaps I'm the only one to have noticed such things. But if you recognize some small kernel of wisdom of what I say, do something about it. Make, fix, create, and encourage others to do the same. I know it is crazy to quote myself from another blog, but this quote makes rare sense in that it's concise and I'm sticking to it. Part of my responsibility as a writer is to put words behind the creative experience that they may be useful to those less inclined to say what they do or reflect on its value. Human beings have always had morality, and long before organized religion, in that they made beautiful and useful things and cared for each other. In the meantime I'm on my way to Marc Adams School of Woodworking to teach for 7 days. Woodworkers are my kind. We speak the same language, about joints and quality of workmanship. We explore design, and in our own small ways attempt to make the world a better place. Joe Miller sent a link to this video, Humane Representation of Thought, which, though about software in part, has to do with the way abstraction can be used to build relationship and illustrate thought. 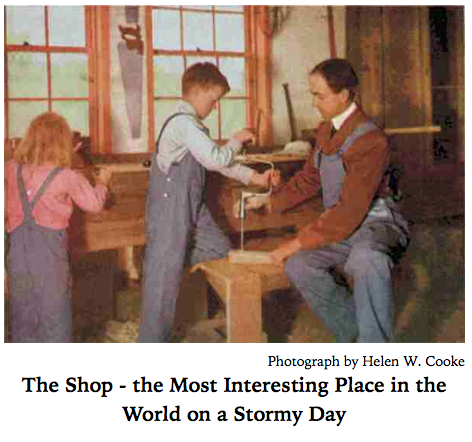 Whether involved in woodworking or writing, or the development of programs, what we are doing is trying to illustrate and share thought, and hopefully thoughtfulness, as is the case in caring craftsmanship. Ivan Illich wrote about "Tools for Conviviality." I believe you will find this video presentation by Bret Victor to be along the same lines. The tools of both software and hardware, as well as those in the wood shop can be directed toward a more meaningful life and richer culture for all. Make, fix, create and grow from the experience. 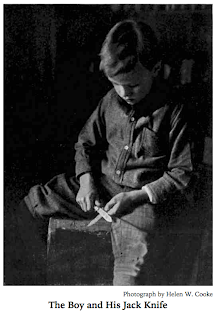 In small villages and towns throughout the world in the latter part of the 19th century, craftsmen went to work making Froebel's gifts of early childhood. The image shown above is from the Sverresborg Trøndelag Folk Museum in Trondheim, and is one of many photos from their collection online. These gifts represented a revolution in education, in which education was put directly in the hands of local individuals. We are now facing a revolution in which education is being taken out of local hands and outside of local control, and outside of local initiative. The revolution is called "common core." This video attempts to explain it, but also makes a lie of the claims that common core is a local initiative. Common Core testing and curriculum are offered by Pearson Education, in a global big business initiative having a major effect on education. The claim is that curriculum is left to local control, but we will find that what we get is not as lovely as a Froebel Gift. All of this is going to come to the forefront of the American presidential campaign, as Jeb Bush has close ties to both common core and to Pearson Education which recently admitted spying on American teens. Pearson's claim was that they need to protect common core from cheaters and they make no apologies for spying on kids. We've seemingly abandoned any trust in the child's natural inclination to learn, and as we have done so, we can watch American education go down the drain, making our citizenry even more stupid than we are today. A few years back, President Obama announced a "race to the top" which was his proposal for education, in which states would compete for additional funding based on proposals of things they would do, but only if new funding was in place. Now, the funding is over and states that had promised so much are financially challenged to continue their initiatives, and have little to show for all the money that was poured their way. I suggest that we take all matters having to do with the education of our kids into our own hands. Putting craftsmen to work making Froebel's Gifts and giving our children the self-activity to direct their own lives would be better than spending billions on Pearson education. Just think of it this way. 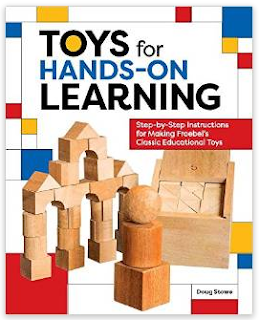 Using Froebel's gifts transforms the way kids think. Making Froebel's gifts gives the advantages of craftsmanship (character and intellect) to those who make them and share them with their kids. Today I am packing for travel to Marc Adams School of Woodworking. I dreamed last night that I was hurtling along a long narrow road at break neck speed while calling my wife on my cell phone so that I could ask her how her new tires were gripping the road. She was in the car ahead and driving at an even greater speed. In real life my wife and I may not be living such a fast life, but we as a culture, as a nation, and as people are hurtling down a road we've never driven before, that's full of potholes, lost shoulders and logging trucks. We have no clear vision of what lies ahead, and so it makes some sense to slow down, drop the cell phones, stop the senseless chatter and take some serious measures to stabilize the future of humanity. One of the best things we can do for the future of the planet, but also for our own lives is to take materials (and matters) into our own hands and shape them into new forms of useful beauty. Working quietly with our hands provides the opportunity to slow down, and shape our cultural environment in ways that are far less costly to our natural environment than the life so many of us live now. The craftsman is not only involved in shaping materials, he or she is also involved in the process of shaping self. Character and intelligence are each matters of the hand. In the meantime, I am preparing for my annual trip to Marc Adams School of Woodworking. My weekend class on Scandinavian bent wood boxes starts on Saturday (June 20) and my week-long class Simply Beautiful Boxes will follow on June 22. About a month ago, I got a copy of the British magazine Living Woods in the mail. The Editor in Chief, Nick Gibbs had been seriously injured in a motorcycle accident and there had been some question as to whether the magazine would make such a comeback. So it was a good, welcome and rare thing to receive in the mail. Living Woods is about working green woods, using simple tools, and having the kind of life that comes when one is tied more closely to nature. In it you will find articles about coppicing, wild flowers, harvesting your own firewood, making and using simple tools to shape wood, and more. It is a magazine I hope will find readership in the US, and I wish Nick well in his further recovery. In the meantime, Shell plans to drill the arctic, the presidential campaign in the US is falling into full swing. Over half the candidates deny Global warming and the dangers inherent in what we are doing to the planet and its resources, and the whole of the presidential candidate field is literally out of touch with what the hands contribute to human life, and how they might shape the character and intelligence of our kids. 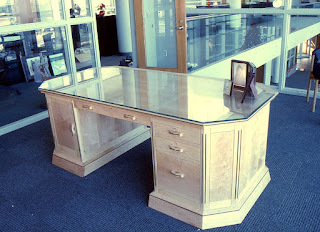 I spent yesterday in Little Rock refreshing the finish on office furniture I had made for the director of the Little Rock Regional Chamber of Commerce so that it can be used in the office of the CEO of Cranford, Johnson, Robinson and Wood advertising agency in the building they are restoring in downtown Little Rock. It was interesting for me to revisit work done 15 years ago as I readied it for new service. Finished work takes on a life of its own and we learn not only in the making of it, but by having the opportunity to observe it over a period of time as it ages, hopefully with grace. Later, after the opening of the CJRW agency's new office in Little Rock, I will be able to share photos of the furniture in its new location. Unlike the image shown above, the maple has aged to a darker color, showing a less dramatic contrast with the walnut accents. One thing is clear. To make handcrafted work requires an investment in thought, and effort. That handcrafted work lasts is due in large part to the care it receives from those for whom it was made to serve. For someone to commission handcrafted work is for them to enter into a relationship with another human being, and I have been honored many times by those who have asked me to make something as lovely and useful as I can to serve in their lives. Just as I have been honored to create and grow, I have then in turn been honored by customers having chosen to care for what I have made. I am led to marvel at the gifts I have been given by those who have been willing to set my energies in motion to create. To ask another person to create something that demands his or her growth is risky. It is far easier to simply buy stuff at the local big box store than to ask members of your own community to grow to meet your needs. But are we as a nation not missing some strength in our own communities because we are failing to invest in handcrafted works and the various lives that they produce? As I cleaned and refinished the various pieces I had delivered over 15 years ago, I was reminded of the depth of relationship that can exist between people. In this case, I was set in motion to make and grow, and then for all these years, what I had made was cherished and protected, which in itself also requires effort and concern. What Otto Salomon had said about the handcrafted object applies. The value of the carpenter's work may lie in the object the carpenter makes, but not solely there. The diligent craftsman cares about his or her work, and in that concern is the foundation of community upon which all further growth takes place. (or not) And craftsmanship is sustained by those who are willing to invest in it. I just finished 5 days with friends making Scandinavian bent wood boxes. In addition to teaching how to make them, I was able to make some myself, and it helped me to prepare for a weekend class at Marc Adams School of Woodworking on the same subject. One of the bentwood boxes I made in class as a demonstration is shown above. The Scandinavian bent wood boxes are called tiner in Norwegian. A single box is called a "tine" pronounced tina, which means cheese box, connecting it with its humble origins. This is my last day of Scandinavian Box making at ESSA and it has been a delight to spend time with students who have such an interest in growth. Each has done good work. I have also had some time to do some box making on my own, preparing me mentally for teaching Scandinavian Bent wood boxes as a weekend class at Marc Adams School of Woodworking June 20-21. Traditional Scandinavian bent wood boxes, unlike Shaker boxes, came in many styles and designs worked out by individual craftsmen in villages throughout northern Europe. Today we will finish our projects, clean up the shop, reflect on what we have learned, and carry home the things we have made. The true value of the student's work is not in the object made, but in the student. The box shown above is one I made illustrating a latch design which locks with a pin through the handle. Quite effective and consistent with tradition. The word tine in Norwegian means cheese box, tying these well crafted and beautiful objects to their humble origins. This will be day 4 of Scandinavian box making at the Eureka Springs School of the Arts, and my students will each have two or more boxes to show in our afternoon studio exhibit. Today things slowed down enough for me to take some photos. I have been experimenting with other designs from Scandinavian box making and demonstrating a variety of techniques. Student work is shown in the photos. My excellent students have been encouraging my own exploration of techniques, and I am reminded that learning is always experimental, and must by its very nature, be experimental to be at its best. Sometimes the experiments in public education are rather large, like the one in LA to put an iPad in each student's hands. At this point it's results have disastrous, as described in this article in Education Week: Q & A: A Hard Look at L.A.'s Troubled Digital Learning Initiative. But students are not like the products you find on supermarket shelves. They each have unique qualities that will be expressed in their work. And as much as educational policy makers would love to make schooling as efficient as Walmart sells stuff, we'd best not head in that direction. The Los Angeles School Board pulled the plug on the 1.3 billion dollar iPad program and has asked Apple and its partner Pearson Education for a refund. ALEC (the American Legislative Exchange Council) is an organization founded in 1973 to promote free-market ideas throughout society. ALEC has about 2,000 members who belong to state legislatures. It is funded by major corporations. Its purpose is to write model legislation that members can bring back to their state, to spread the gospel of ALEC. It supports charters, vouchers, online charters–all forms of privatization. It opposes collective bargaining. It does not believe in due process rights for teachers or any form of job security for public employees. It does not support local control, as it promotes laws that allow state commissions to override decisions by local school boards if they deny charters to private groups. Among its proposals is the third grade reading guarantee, in which children are flunked if they don’t pass the third grade reading test. What this has to do with free-market capitalism is beyond my understanding. It is punitive towards little children, putting more faith in a test than in teachers’ judgement. There is no research to support this policy, but we know already that zealots are unimpressed by research or evidence. So far 16 states and DC have adopted the rule that children who are not proficient readers by third grade are to be flunked. The irony is that in Finland, they don't begin reading in school until age 8 and by the time their students reach the age of 15 and testing in the international PISA study, they far surpass American readers in 30% less time. So what could children be doing in school while their brains mature and make them ready for reading? Wood shop, of course. The situation om American education is one in which conservative politicians, responding slavishly to ALEC are putting our nation's future and the intellectual lives of our children at serious risk. Former first lady Barbara Bush is turning 90 and as a long time advocate of literacy, is putting her faith in some new technological device which she assures us will increase literacy among kids. With all due respect, I wish her well. But we would do better for our kids if single moms (young fathers, too) got a living wage, enabling them to work only one job, giving them time to read to their children and to themselves. There is no substitute for being read to, and I do not mean by a machine. There is a very strong statistical connection between poverty and poor performance in schools. The policy makers want teachers to fix what they refuse to fix themselves. When it comes to reading, a study in Ohio in 2014 concluded that 20% fewer 3rd grade students from economically disadvantaged families were able to read at proficient levels than those who came from families not facing poverty. In math the divide between 3rd grade students in the two distinct economic classes was even greater, with almost 30% fewer economically distressed students testing "proficient." Today in my ESSA box making class, we began making lids, bottoms and latches for our Scandinavian bent wood boxes. The kindergartner often forms his sentences for the child, over-directs him when he is matching colors, gives names to the objects he constructs without waiting for him to do so, moves his blocks, sticks, tablets, rings into more accurate position, changes his spacing when incorrect, rearranges his inventions, selects the colors for his parquetry work, — and all for what reasons? Primarily, to produce a better effect, it is probable, glorying in the consciousness that the work on every child's table is exactly right, and blind to the truth that uniformity must always be mechanical; and secondarily, to quiet her own feeling of impatience, which sometimes comes from nervous exhaustion and sometimes from an over eagerness to get a quantity of work done regard less of the method by which it is obtained. There is a thirdly, too, which is that the inaccurate work, the awkward designs, the unfortunate blending of colors which the little one inevitably makes at first, so offend her artistic eye that she trembles with eagerness to set them right, forgetting that by so doing she is imposing her superior taste upon the child and thereby failing to develop his. We shall never see this matter clearly, nor know how to bear with the crudity of the child's work, until we learn that the crudity is natural and therefore to be respected, and that it is in a sense beautiful after all, for it is a stage of being. There are similar dangers in most instructional work. Distance must be left between teacher and student, so that both mistakes and discoveries can be made. Knowing the value of mistakes and discovery the teacher with educational tact, sets up a situation in which real learning takes place and then allows the student to learn by choosing not to interfere too much. Yesterday in my ESSA class making Scandinavian bentwood boxes, we tried bending some spalted maple which immediately cracked when wrapped around the form and despite having been boiled for a sufficient length of time to soften the fibers of the wood. Part of the problem is in the maple which is not known for its bending capacity. Some of the problem may also have been in the fact that the maple, being spalted was partially decayed, thus weakening its fibers. We will remember our lessons better for our having tried and failed, than if we had success right off the bat. But best was that my students used their own minds to help determine the line of cause and effect. "Of course, there is great difference between the disciplinary value of that study in which the pupil solves his own difficulties and that teaching in which the teacher accompanies the pupil, supplying the needed information or suggestion at every step of his progress. The latter is not worth much for character building for the reason that it is not apt to become a part of the organized self. . . . The school cannot afford to expend much energy in acquiring such knowledge." (Geo. P. Brown.) –Report on Correlation of Studies by Committee of Fifteen. With annotations by Geo. P. Brown. The gang of 15, more commonly called the "committee," was established to set the guidelines in 1895 of what American education would be like in the future, and in particular how teachers would be trained. The full report can be read here: "Correlation of Studies". In other words, and if you are one who would leap ahead in preference to reading too much, the gang of 15 decided that the history of education was extremely important, but should not be taught to teachers except in the most cursory manner. Perhaps that was a good choice for the sound mechanics of the operation. For instance, if teachers were to become more aware of Comenius, Froebel, and Salomon, they would be given the mental breadth to understand that the means through which they were expected to teach was unsound and ineffective. Today I will begin teaching an adult class to make Scandinavian bent wood boxes. Prevailing assumptions: The "designer" is one who comes up with ideas for others to make. The maker simply makes.... for the heck and the hell of it. On the other hand, the maker may also be the designer, or the "designer" may not be an individual person, as the "design" may actually have arisen through a process of cultural growth over hundreds of years as is the case with the Scandinavian bent wood box shown below. The word "designer" has a certain cachet. The idea however, of being elevated somewhat apart from the maker is somewhat cachetic. The prevailing assumption is that the designer is the smart one, and that the maker simply goes through motions mindlessly, which is very often not the case. This interesting illustration is from a design blog, attempting to illuminate the process of "design thinking". You'll notice that it goes somewhat astray in that it suggests the development of a model at the midpoint of the process, but then leaps backward to presenting "your idea to others for feedback," as though the model itself and its relationship to the problem it is intended to solve is no longer a concern in the design process. The maker, (perhaps not the designer?) would present his "model" for testing against the problem, not the "idea" of it. So where does "Maker Think" come into the creative process? I prefer it to the egotism inherent in "design". It suggests that making is not a thoughtless process, and that the maker and making are integral to the design process. In educational Sloyd, it was recognized that the integrated processes of making and design, were means through which the character of the individual and the character of the nation were formed. In the meantime, efficiencies of manufacturing led to marginalizing the value of skilled hands and cut the value of their efforts from the bottom line. Observe the character of our communities and the numbers of folks we have failed, left uncreative, unfulfilled and dependent, with any number of sociological and psychological problems in addition to poverty and ask how our ignorance of the value of educational Sloyd has been working for us of late. The tine shown in the photo is a favorite of those I have designed and made. It conveys a sense of fanciness, yet is inspired by actual Scandinavian designs and processes of an earlier time. I hope to make another similar one, as lovely as I can, during my ESSA class this next week. Dz.... dz.... dz.... Rap, rap, rap, rap, rap! "Here a board and there a board; Pray, what use are they?" The gifts of Froebel were intended to give form and understanding to the child's world. The occupations were intended to give the child the ability to act creatively within the world. Woven through the Kindergarten learning experience were songs and finger plays that helped children to understand and feel a part of that which they observed around them. The songs were of the life children might discover around them. 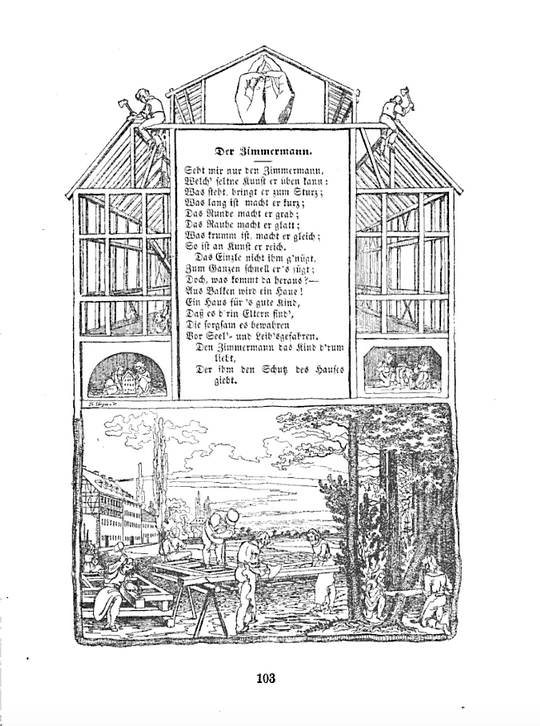 The Carpenter (Der Zimmerman) was one such song, the words above translated from Froebel's book, Mother Play. The whole of Kindergarten was designed to bring the child into context with the whole of life. 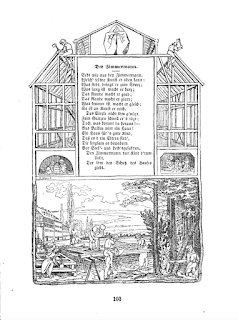 In the illustration, note how the hands were used to convey the image of a house. 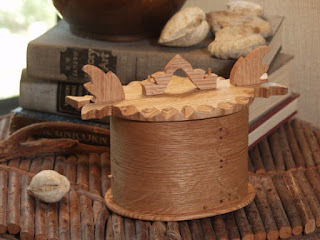 I am getting ready for my 5 days of making Scandinavian bent wood boxes with the Eureka Springs School of the Arts. 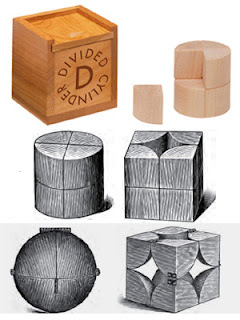 Scott Bultman, a Froebel enthusiast and filmmaker I mentioned in yesterday's post sent me the image at left with the suggestion that I figure out how to make the hinged sphere. One way would be to design it in sketchup and print it. 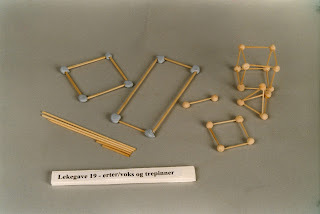 It would be interesting for some parents to use their 3-D printers to make Froebel's gifts for their children. On the other hand, to make the gifts from real wood has merit, and offers challenges to both the mind and hands, that printing in plastic does not. At some point, I may use sketchup to design the various gifts so that they can be downloaded and printed by those who have little or no interest in developing and exercising skill. But would that be useful in the larger sense of the word? While the whole world is racing toward 3-D technology, there may be greater merit in doing that which others will out of laziness or disinterest not do. I found very tiny brass hinges for making a hinged sphere and ordered them from China through Etsy.com. To make a doubly quartered sphere on the lathe, each section being 1/8 will require gluing (8) 1 1/2 in. cubes together in a larger cube with brown paper between. After turning a 3 in. sphere, the sections can be forced apart and hinged. Each section will have to be routed twice to form hinge mortises, allowing the parts to nest tightly together as a ball. In both shops, home and at school I am working to be ready for next week's class making Scandinavian bentwood boxes. This must be a busy week for publishers as I have two books newly listed on Amazon. Neither is actually ready for release, but publishers are wanting the industry to know what's coming down the pike. For instance, the book shown at left is my book I've been calling "Making Froebel's Gifts." I've known that with Froebel no longer being the household name it once was, a fresh title would be worked out, and this seems to be it: "Toys for Hands-on Learning". The other book is a compilation of my first two box making books, and will be published by Popular Woodworking Books. The working cover of Build Beautiful Boxes: 25 Custom Designs has a serious typo on it and will be corrected by the publisher. On the subject of Kindergarten, readers still have 15 days to support to Scott Bultman's film project on the Kindergarten revolution that I hope to see return to American education. You can support it on the kickstarter site here, as I did. I have the last of my end of school year meetings today and tomorrow, and I'm in the thick of summer planning with an ESSA class beginning on Monday and classes at Marc Adams School of woodworking following in two weeks. Over the next week, I'll be working with adult students to make Scandinavian bent wood boxes. At the liquor store last night, the clerk suggested that "now with school being out, I might have time to relax." But that is seldom the case. Even when teachers are not in the classroom, they are often occupied in preparation of some kind. Way back in the history of manual and industrial arts, it's original intent, as conceptualized by John Runkle at MIT and Calvin Woodward at Washington University, and in addition to creating a skilled and caring workforce, was to give relevance to teaching math. Engineering students just didn't arrive at its finer points without having some means through which to apply what they were expected to learn. And so, when educational policy makers leaped to the erroneous conclusion that we no longer needed wood shops (and having bought into the weird notion that we could no longer compete as a manufacturing nation), they cut the supply of competent engineering students passing through schools, which then made it necessary that we recruit them from abroad. I am reminded of my sister, who was told by her 9th grade math teacher that she would never amount to anything in math... that she just simply didn't have a mind capable of it, but as an adult, went on to design counter-change smocking patterns in use through out the world. And so traditionally taught math teachers, who think math is about numbers could do some homework. Math should always be taught upon a foundation of doing the real things that the numbers represent, and that requires stepping away from the blackboard into real life. It seems that one of our human traits that does us the least good (from the standpoint of our humanity) is to objectify relationships. For example we take a set of objects and count them, assign a number and forget that number represents complex sets of relationships between and within each. We can take a whole classroom of kids and assign test scores and other means of abstraction to create a view of those kids in which they are thus managed, but seen only in part. Numbers and our ability to reduce things to numbers is the way we step back to take a more general view of things, but we should never forget that the subject of all that counting is real, personal, and of value in closer relationship. It's OK to take things apart, but do so carefully, as you may be expected to put things back together. It appears that my new book has been named and listed on Amazon, complete with cover design. The editing is still taking place and the proposed date of publication will come much later in the year. I have two classes coming up this summer in making Scandinavian bentwood boxes, and there are openings in each. The first is next week with the Eureka Springs School of the Arts. You can register for it at Essa-art.org. 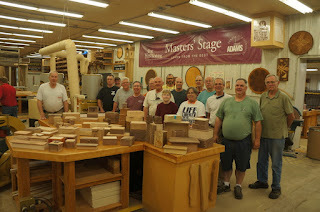 The second class is for a weekend only, June 20-21 at the Marc Adams School of Woodworking near Indianapolis. Go to Marcadams.com to register. If you are of Scandinavian descent, either of these classes would be a wonderful opportunity to tap into your roots. If you are not Scandinavian, making one of these boxes would be a great way to build skill and explore creativity. 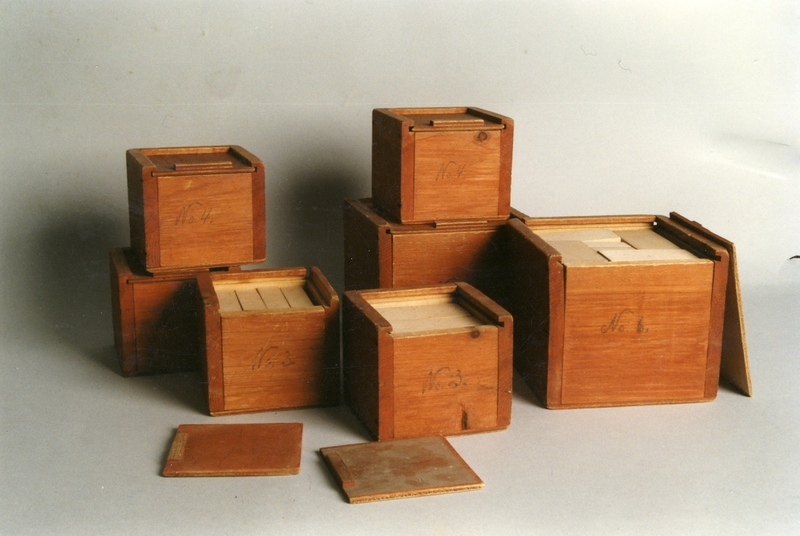 Unlike Shaker boxes which are made in specific sizes and to a specific design, Scandinavian bentwood boxes were made in small villages throughout northern Europe, so there are plenty of excuses to get creative. Shown at the top is the first Scandinavian bentwood box I made in 2000. So let me assure you that even your first work will likely be worth keeping for a long time. The photo at left is of the forms we will use in class. Please join me if you can. We had an interesting discussion at school today in our end of school meetings. It seems that school is the only place where 95% is a good grade. If I were to make a box and it only opened 95% of the time, it would be judged a 100% failure. If a bridge were to last only 90% of its planned life and was then to collapse, the engineer would be run out of business. If that engineer had gotten only 95% of his initial calculations right, the parts of the bridge would never have gone together in the first place. I realize that not all kids will get 100% on their math tests, but when we say that 85% will do, what are we saying about the value of the content? If it was truly important to the life of the child, would we not be suggesting higher standards, of those who are capable of them and I'm concerned that if we do not, we may be telling the child that we are only pretending material is important and necessary. Real life is not quite like that. If you were 90% right checking out goods at your local Walmart, you would be fired your first day. Yesterday morning I went on an adventure hauling logs to a local sawmill. The journey led me into the life of a local farmer who explained that the logs won't be milled right away, because he's cutting hay and feeding cattle. Today I'll take another load of logs to another sawyer in the hopes that they'll be cut in a more timely manner. Richard Bazeley in Australia plans to get his 7th year students making their own tinker toys as shown in the photo above. He then plans to have them do a collaborative design project, combining all the sets to see what their imaginations come up with. In addition to end of school staff meetings, I am getting ready for a Scandinavian box making class with the Eureka Springs School of the Arts in my Clear Spring School wood shop. And I've turned one more box as shown in the photo at top. I have a staff meeting at the Clear Spring School in which we will work out our class schedules for the next year. If the calendar were just the same for each year, we could get to the point that everything would run like clockwork. But that is never the case, and if it were, there would be no creativity as each and every other thing would fall into a rut. So we should be grateful that the earth's rotations create a calendar that is not precise year after year. That things are slightly out of kilter, mean that we adapt and create anew. The same goes for human performance, and the work of the hands, every time they are brought fresh into our creative concerns. This morning, I'll haul some white oak logs to a local sawyer to be milled and try to be back before meeting time. The logs have grown up in the natural world and will no doubt carry the life they led in my forest into my creative time as I craft beautiful and unique objects from the lumber that comes. On Sunday, we attended the first time production of a one act play written by my friend Tom Gorsuch. When voices come together for the first time on stage, there is some creative chaos that emerges, and it was wonderful to see the interpretation on stage as local actors gave their own voice to Tom's written words. Count Spatula, in a comment below, offers a translation of a Norwegian poem, and describes how written words and musical notation, are narrowed so as to miss the greater potential available when things come truly from the heart and the full soul of human expression. Human expression can not be reduced to musical notation, or to written words. Even poetry can ill suffice. And so, I write regularly about the hands and what they bring to life. It's up to you to provide directorial response and interpretation as you engage in the wisdom of your own hands. Yesterday in the wood shop, I turned yet another maple box. This one has a small turned heart at the top. The same question arises in all of education, whether teaching children or adults, and most particularly in teaching how to do, not simply what to know. The image above is of a set of salt and pepper shakers in the works.